Comes with forms and checklists to help you administer leave! The federal Family and Medical Leave Act (FMLA) helps employees balance the demands of work and family. But the law can be hard for employers to apply in the real world -- especially when it comes to tracking intermittent leave, completing the proper paperwork, and determining eligibility for different types of leave. 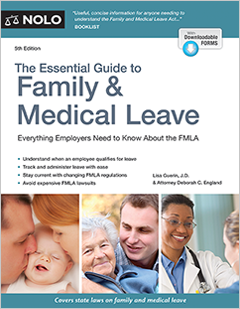 The 5th edition of The Essential Guide to Family & Medical Leave covers all of the latest changes to the FMLA, including the new regulations and court decisions interpreting the law, as well as changes to related state family and medical leave laws. Does the FMLA Apply to My Company? Is the Employee Eligible for FMLA Leave? 2. Is Your Company Covered by the FMLA? 3. Is the Employee Covered by the FMLA? 7. How Much Leave Can an Employee Take? How Many Weeks May an Employee Take? The Family and Medical Leave Act (FMLA) is a law with an undeniably noble purpose: to help employees balance the demands of work with personal and family needs. Since the FMLA was enacted in 1993, millions of employees have relied on it to protect their jobs while taking time off to recover from a serious illness, to care for an ailing family member, or to bond with a new child. The FMLA has been amended several times since its enactment, most notably in 2008 to allow military family leave. Surveys consistently demonstrate that the FMLA has not had a negative impact on business growth or profitability. In a 2013 survey by the federal Department of Labor, for example, more than 90% of responding employers said that complying with the FMLA had either a positive effect or no noticeable effect on their companies. This same survey also revealed that suspected employee abuse of the FMLA was rare (2.5% of responding employers) and actual proven abuse even more so (only 1.6% of responding employers). At the same time, surveys also reveal that employers find it difficult to comply with some parts of the FMLA. In 2017, more than half of employers responding to the Littler Annual Employer Survey found it difficult to accommodate requests for unpredictable intermittent leave or requests to extend leave beyond the requirements of the FMLA. In a 2007 survey conducted by the Society for Human Resource Management, more than half of respondents said it was either “very difficult” or “somewhat difficult” to track intermittent leave, to determine whether a health condition qualifies for FMLA leave, and to manage the FMLA’s notice, designation, and certification requirements. Experience has shown that it can be difficult to apply the FMLA when dealing with employees in the real world. For example, do you know what to do in the following situations? An employee who needs leave is also covered by workers’ compensation, a state family and medical leave law, and/or the Americans with Disabilities Act—and the requirements of those laws appear to conflict with the FMLA. An employee asks for time off but won’t tell you why or is reluctant to reveal personal medical information that might entitle the employee to leave. An employee wants to take FMLA leave at your company’s busiest time of year. An employee wants to take time off as needed for a chronic ailment, rather than all at once, and can’t comply with your company’s usual call-in procedures. An employee doesn’t give exactly the right amount or type of notice, forgets to hand in a medical certification form, or can’t return to work as scheduled. An employee decides, after taking FMLA leave, not to come back to work. These issues—and many more like them—come up every day, and managers have to figure out how to handle them legally and fairly, while protecting the company’s interests. That’s where this book comes in: It explains, in plain English, how the FMLA works. It can be tricky to figure out what to do in a particular situation, and this book’s step-by-step approach will help you sort things out and meet your obligations. This chapter will help you get started. It introduces the FMLA’s basic requirements, with special emphasis on your responsibilities as a manager. It explains how other laws and company policies can affect your obligations under the FMLA when an employee needs time off for family or medical reasons. And it provides a roadmap to the rest of the book, so you’ll be able to easily find the answers to all your FMLA questions. In a nutshell, the FMLA requires companies of a certain size to allow employees to take time off to fulfill certain caretaking responsibilities or to recuperate from serious illnesses. If your company is covered by the law, an eligible employee is entitled to take up to 12 weeks of unpaid leave every 12 months to bond with a new child, recover from his or her own serious health condition, care for a family member with a serious health condition, or handle qualifying exigencies arising from a family member’s military duty. The FMLA provides a separate entitlement for military caregiver leave. Employees may take up to 26 weeks of leave, in a single 12-month period, to care for a family member who incurs or aggravates a serious illness or injury in the line of duty while on active military duty. However, this provision doesn’t renew every year like the 12-week leave provisions described above. Instead, it is available only once per servicemember, per injury. Employees who are entitled to this military caregiver leave may also take other types of FMLA leave, but they can take no more than 26 weeks off, total, in a single 12-month period for all types of FMLA leave. FMLA leave is unpaid, although an employee may choose—or the company may require employees—to use up accrued paid leave, such as sick leave or vacation, during this time off. The employer must continue the employee’s group health coverage during FMLA leave. When the employee’s leave is over, the employee must be reinstated to the same position or an equivalent position, with the same benefits as the employee had before taking time off. Although there are a few exceptions to this requirement, they apply only in very limited circumstances. Special rules apply to public employers and schools. The FMLA imposes slightly different obligations on government employers and schools, which we don’t cover in this book. Similarly, in unionized workplaces, a collective bargaining agreement—the contract between the company and the union—might impose different family and medical leave obligations. Because every collective bargaining agreement is different, we can’t cover them all here. The moment an employee comes to your office and says, “My wife is having a baby,” “My mother has to have surgery,” “My son was injured in Afghanistan,” or “I’ve been diagnosed with cancer,” you’ll have to figure out whether the FMLA applies, provide notices and meet other paperwork requirements, manage the employee’s time off, and reinstate the employee according to strict rules and guidelines. Whenever you’re faced with a leave situation that might be covered by the FMLA, you should ask yourself the questions listed below. This checklist will help you make sure that you meet all your legal obligations and don’t forget anything important. Each of these topics is covered in detail in this book. Step 1: Is your company covered by the FMLA? The answer is yes if you’ve had at least 50 employees for at least 20 weeks in the current or previous year. If your company is covered, it has to post a notice and may have to provide written notice to employees, even before an employee requests leave. Company coverage is explained in Chapter 2. Step 2: Is the employee covered by the FMLA? An employee who has worked for at least 12 months, and at least 1,250 hours during the year before taking leave, at a company facility that has at least 50 employees within a 75-mile radius, is covered. Chapter 3 explains how to make these calculations. Step 3: Does the employee need leave for a reason covered by the FMLA? Leave is available for the employee’s own serious health condition or to care for a family member with a serious health condition, as explained in Chapter 4. Leave is also available to bond with a new child, which is covered in Chapter 5. Military family leave—for a qualifying exigency relating to a family member’s military service or to care for a family member who suffers a service-related illness or injury—is also covered by the FMLA; we explain these rules in Chapter 6. Step 4: How much leave is available to the employee? An employee is entitled to take up to 12 workweeks of leave, either all at once or intermittently, in a 12-month period: to bond with a new child, handle qualifying exigencies relating to a family member’s military service, care for a family member with a serious health condition, or recuperate from a serious health condition. An employee who needs military caregiver leave is entitled to up to 26 weeks off in a single 12-month period. Chapter 7 will help you figure out how much leave an employee may take. Step 5: Did you and the employee meet your notice and paperwork requirements? The employee must give reasonable notice and provide certain information; you must designate FMLA leave and give the employee required notices, among other things. Chapter 8 provides the details. Step 6: Did you request a certification (and if so, did the employee return it)? You can—and should—ask an employee who needs leave for a serious health condition, a serious illness or injury to a servicemember, or a qualifying exigency related to a family member’s military service, to provide a certificate. Chapter 9 explains how. Step 7: Did you successfully manage the employee’s leave? You must continue the employee’s health benefits, manage and track intermittent leave, arrange for substitution of paid leave, and more. In addition, you have to make sure the work gets done while the employee is out, whether by distributing the employee’s responsibilities to coworkers, hiring a temporary replacement, or outsourcing the job. Chapter 10 covers all of these issues. Step 8: Did you follow the rules for reinstating an employee returning from leave? You must return the employee to the same or an equivalent position and restore the employee’s seniority and benefits, unless an exception applies. Chapter 11 explains these rules, as well as what to do if the employee doesn’t return from leave. Step 9: Have you met your obligations under any other laws that apply? Whether or not the FMLA applies, the employee may be protected by the Americans with Disabilities Act, workers’ compensation statutes, state family and medical leave laws, and other laws. To find out about your obligations under these other laws, see Chapter 12. Step 10: Have you met your recordkeeping requirements? If your company is covered by the FMLA, you must keep certain payroll, benefits, leave, and other records, and you’ll certainly want to keep proper documentation of your decisions and conversations, in case you need to rely on them later. These issues are covered in Chapter 13. One of the challenges of implementing the FMLA is that you must meet your legal obligations within a context that can be emotional. After all, employees who qualify for FMLA leave are undergoing major life changes. On the positive side, the employee may be welcoming a new child, with all the joy and excitement that brings. On the more sobering side, perhaps the employee is losing a parent or spouse to a terminal illness, caring for a seriously ill or injured child, or suffering through a painful disease. Although you have to follow the law’s requirements and make sure your company’s needs are met, no one wants to be the hardhearted administrator who responds to an emotionally distraught employee by handing over a stack of forms to be completed in triplicate. The FMLA recognizes that employees who need time off for pressing family or health concerns might not always be able to dot every “i” and cross every “t.” The law provides guidance on what to do if, for example, an employee is too ill or injured to communicate with you, can’t return to work on time because of continuing health problems, or doesn’t complete forms on time. These rules will help you balance your legal obligations with the natural human desire to be compassionate during a difficult time. And, as we’ll remind you from time to time, you have little to gain from imposing strict deadlines and paperwork requirements on employees who are truly in dire straits. Judges and juries are people, too, and they can find ways to enforce the spirit of the law in favor of an employee who needed its protection, even if the employee failed to meet deadlines, give adequate notice, hand in forms on time, or provide required information. Of course, people have different comfort levels when dealing with emotional subjects. Some can easily offer support and a shoulder to cry on; others would rather volunteer for a root canal. If you fall on the more stoic end of this spectrum, take heart: You don’t need to become a therapist—or the employee’s best friend—to show some understanding in a difficult situation. Just remember that a little kindness goes a long way. Acknowledge what your employees are dealing with, cut them some slack if necessary, and work with them to make the law serve its purpose. Properly managing your FMLA obligations is a win-win situation. Employees win because they get time off when they really need it, with the assurance that their jobs will be waiting for them when they come back. You and your company win because helping employees balance work and family leads to greater employee loyalty to the company and all of the other benefits that flow from it, including better morale, stronger retention, and even improved productivity. That’s the carrot; here’s the stick: Violating the FMLA can lead to serious trouble. And we don’t just mean the morale problems and associated woes that can crop up if employees feel that their needs aren’t important to the company. Mishandling family and medical leave issues can also give rise to lawsuits, not just against your company, but against you, individually, as the manager who made the flawed decision. Of course, this is the ultimate worst-case scenario, and chances are good that you’ll never have to face it. If you’re one of the unlucky few, however, your personal assets—such as your home, your car, and your bank accounts—could be on the line, not to mention your career and reputation. FMLA lawsuits are on the rise. More employees are filing lawsuits alleging violations of the FMLA than ever before. For the year ending on March 31, 2017, there were more than 1,200 FMLA cases filed in the federal courts alone; this number has been increasing year over year. The upshot for employers is clear: Compliance with the FMLA—and proof of compliance, in the form of records and policies—is more important than ever. The FMLA isn’t the only law you need to consider when employees need time off for family or medical reasons. Other federal and state laws might also come into play, depending on the circumstances. In addition, a company’s own policies often affect family and medical leave by, for example, providing paid sick, vacation, or family leave; requiring employees to follow certain procedures before taking time off; or dictating how seniority, benefits, and other issues are handled when an employee is on leave. Human resources manager can be sued, individually, for violating the FMLA. Elaine Brewer worked for Jefferson-Pilot Standard Life Insurance Company for 29 years. In July 2002, she requested leave to have eye surgery, estimating she would be out for one to three weeks. While she was out, she gave status reports on her condition to her direct supervisor and to Felicia Cooper, Jefferson-Pilot’s senior human resources manager. After three weeks of leave, Brewer’s eyes had not yet healed sufficiently for her to return to work. At that point, for the first time, Jefferson-Pilot gave Brewer notice of her rights under the FMLA. On July 31, 2002, Cooper spoke to Brewer by phone and asked for the names of her health care providers. Cooper then contacted the health care providers and asked them to submit medical certification forms documenting Brewer’s condition. On August 2, 2002, before receiving the certification forms back from Brewer’s doctors, Cooper accused Brewer of lying about her condition. Although Brewer said she would be able to return to work on August 5, Cooper fired Brewer for dishonesty and insubordination. On August 5, Brewer’s doctor returned the certification form, indicating that Brewer had been receiving medical care during her entire leave. Brewer sued Jefferson-Pilot and Cooper, individually, for violating the FMLA. Cooper argued that she could not be sued personally because she was not Brewer’s employer. However, the court disagreed: Relying on the language of the FMLA and the regulations interpreting it, the court found that anyone who acts in the interest of the employer in relation to an employee could be sued as an employer. Because Brewer claimed that Cooper received her medical status reports, controlled the paperwork relating to her leave, contacted the doctors, and fired her for allegedly lying about her condition, Cooper was a proper defendant in the lawsuit. Brewer v. Jefferson-Pilot Standard Life Insurance Company, 333 F.Supp.2d 433 (M.D. N.C. 2004). Whenever an employee requests time off pursuant to any law or company policy, you must ask yourself whether the FMLA applies. The employee isn’t required to explicitly ask for “FMLA leave”; it’s your responsibility to determine whether the employee’s time off is FMLA-qualified. An employee on workers’ comp leave, temporary disability leave, parental leave, or even vacation might be protected by the FMLA, if the employee meets all of the criteria. And you will certainly want to count that time off as FMLA leave, not only to make sure the employee’s rights are protected, but also to put some limit on the total amount of time an employee can take off in a year. When the FMLA and another law or policy both apply, you may have to provide more than the FMLA requires. If other laws or your company’s policies give employees additional rights, you must honor them as well. The employee is entitled to every protection available, whether it is provided by the FMLA, another law, or your company’s policies. The basic rule about what to do when the FMLA and another law overlap is easy to state: You must follow every applicable provision of every applicable law. In other words, you may not focus solely on the FMLA and ignore your company’s obligations under other state or federal laws. If both laws apply to the same situation, you must give the employee the benefit of whichever law is more generous or provides greater rights. Antidiscrimination laws, which prohibit discrimination based on certain protected characteristics. The Americans with Disabilities Act (ADA) and similar state laws might come into play if an employee’s serious health condition is also a protected disability. Laws that prohibit gender and pregnancy discrimination might also overlap with the FMLA. Workers’ compensation statutes, which require most employers to carry insurance that pays for medical treatment and partial wage replacement for employees who suffer work-related injuries or illnesses. An employee who needs workers’ compensation leave almost always has a serious health condition under the FMLA, as explained in Chapter 12. State insurance programs, which provide some wage replacement, usually funded by payroll deductions, for employees who are unable to work due to a temporary disability (including pregnancy and childbirth). A few states, including California, have paid family leave insurance programs, which provide similar benefits to employees who take time off to bond with a child or care for a family member. An employee on FMLA leave might be entitled to some compensation from this type of program. Company policies interact with the FMLA in a slightly different way. For the most part, your company may give employees more rights than the FMLA provides, but it may not take FMLA rights away. For example, if your company has a family and medical leave policy that allows employees to take up to 16 weeks of parental leave, you cannot disregard that policy and give employees only the 12 weeks required by the FMLA. If your company’s policies are less generous, however, the company must follow the FMLA: It must, for example, give employees a full 12 weeks of parental leave, even if the company’s policies provide for only six. The FMLA regulations make clear that employers may require employees to follow their usual procedures when taking leave, as long as those rules don’t violate the FMLA. For example, your company may enforce its usual notice rules—such as requiring two weeks notice to use paid vacation time—for employees who want to use paid leave during their FMLA leave. And, your company may generally require employees using FMLA leave to follow other leave requirements, such as calling a particular person to report an absence, as long as those rules don’t require more notice than the FMLA requires. These rules are explained in Chapter 8. In addition to these general rules, the FMLA also makes explicit reference to particular types of employer policies. For example, the FMLA says that you can fire an employee for substance abuse, even if the employee takes FMLA leave to go to rehab, but only if your company has a policy allowing it to do so. Because this is a potentially confusing area, we’ve devoted Appendix B to company policies that can affect your FMLA obligations. This appendix identifies the most common areas in which company policy might come into play and provides some sample policy language that will help you maximize your company’s rights. In addition, you’ll find policy alert icons throughout the book. These icons let you know that your company’s policy could determine your rights and obligations regarding that topic. This book explains every aspect of the FMLA, from figuring out whether your company is covered by the law to reinstating an employee returning from FMLA leave. We cover these topics in the order in which they will generally come up as you administer an employee’s leave. In addition, we provide helpful appendixes that explain how your state’s laws and your company’s policies could affect your company’s FMLA rights and obligations. We strongly advise you to read the whole book, even if you are already familiar with some aspects of the FMLA. Because the FMLA imposes fairly tight deadlines on employers—and because the way you handle initial issues can affect your company’s rights down the road—you’ll find it very helpful to understand the whole picture before you have to handle a leave request. Also, there have been significant changes in the law and regulations in recent years, so you may need to learn some different requirements. Once you’ve reviewed every chapter, you can use the book as a reference, to quickly look up the information you need. Employee may sue for FMLA benefits promised in employee handbook, even though employee wasn’t eligible for leave. Steven Peters marketed pharmaceutical products to health care providers for Gilead Sciences, Incorporated. Peters was off work for shoulder surgery from December 5 to December 16, 2002; Gilead sent him a letter identifying his time off as FMLA leave. The letter tracked language in the company’s employee handbook, including that employees were entitled to 12 weeks of leave, followed by reinstatement. The letter also described the eligibility requirements for FMLA leave, but didn’t include the requirement that the company employ 50 employees within 75 miles. In fact, this requirement wasn’t met. On March 4, 2003, Peters began a second period of leave after he began using neurontin, a drug that can cause serious side effects. Gilead again sent him a letter identifying his time off as FMLA leave but Peters never got this letter. On April 16, Gilead received a letter from Peters’s doctor, releasing him to return to work on May 5. On April 21, Gilead offered Peters’s position to someone else, who accepted it and began work a week later. On April 25, Gilead sent Peters a letter indicating that it could not reinstate him because he held a “key” position (apparently an effort to use the “key employee” exception, covered in Chapter 11). Peters sued, and Gilead claimed that he wasn’t entitled to FMLA leave because he didn’t meet the eligibility requirements. The Court of Appeals eventually found that, although Peters may not have had an actual FMLA claim, he could still sue Gilead for promissory estoppel. Because Gilead’s handbook and letter promised that Peters was entitled to reinstatement after 12 weeks of leave, Gilead might be responsible for the damages Peters suffered because of his reliance on the promise in taking leave. Peters v. Gilead Sciences, Inc., 533 F.3d 594 (7th Cir. 2008). Common Mistakes—And How to Avoid Them, which will help you steer clear of legal trouble in applying the FMLA. Complying with the FMLA can be a challenge, but the materials in this book will help you handle your responsibilities legally, fairly, and confidently. The first step is to figure out whether your company is covered by the law—and, if so, to give employees notice of their rights under the law—using the guidelines in Chapter 2. If you already know that your company is covered and has met its posting and policy obligations, move on to Chapter 3, which will help you figure out which employees are eligible for leave.